I thought that you might enjoy some photos from inside the Botanic Gardens. We spent some time in the new inside area of the gardens, where there is a two story Orchid and Bromeliad display. 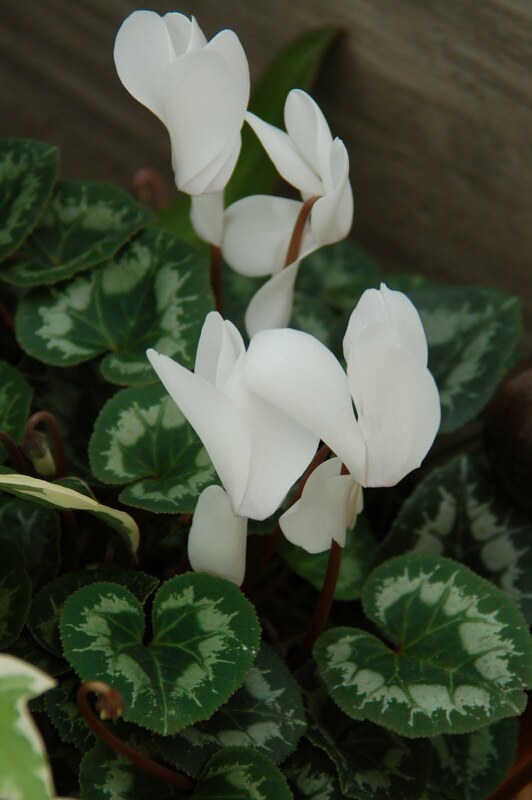 There is also another new area called the Orangery, where green houses are fronted by an enclosed walkway, filled with Giverney benches and plantings (mostly orchids, but also some cyclamen) along the wall. It is a beautiful new structure and well worth the visit. You probably have been a bit surprised at the number of 'blogs' that I have written this week. I have been so neglectful of this blog, and I wanted to share some goodies before I step away for a while. I am going to warm my bones a bit, with sweet hubby. We hope to hit Starbucks a few times a week, where I can upload some photos and share sketches or plants with you. Last week, I worked on this lily...... free hand, with my art group. One of the women, brought a lily in the palest of pinks, and I just decided to paint it (before the tomatoes). I worked on it after I took this photo....adding colored pencil to enhance it. So, now it's a mixed media (4x6) on Fabriano paper. I am hoping to create lots of these little ones to sell....just quick sketches that people can afford. How much would you pay for a little 4x6 watercolor? I have never been very good at pricing... so your input would help. 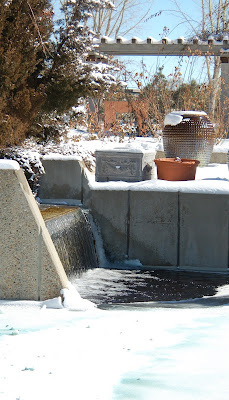 I thought you might enjoy just a few more outdoor photos from the Denver Botanic Gardens. Even in the winter, there is amazing beauty in the plants when they are mixed with snow. No more commentary..... just enjoy! Yesterday, I headed down to the Botanic Gardens in Denver, to drop off a painting for a show. It was mighty cold but oh, so sunny! No surprise, but there weren't many people at the Gardens, and no one was outside. 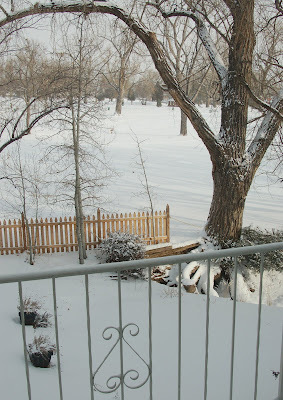 The snow was pristine and so was the setting.... so I thought that I would share some of my photos with you. Winter is such a special time to visit the gardens. To see the plants at rest and feel the quiet and peace within the gardens, is a gift that we all deserve. I hope that you can get to your gardens during this time of the year, just to experience this special bliss. A note: The Moore Sculptures were being loaded up and taken back from whence they came. What a beautiful show that was a gift to Denver. It went for almost eight months and the sculptures within the garden were so beautiful. I am grateful that we could experience this special exhibit. 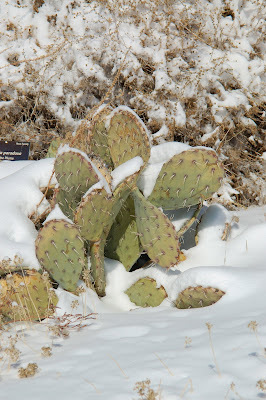 the gardens in the 12 degree temperatures. This bench looked so peaceful. Loading up the Moore Sculptures. 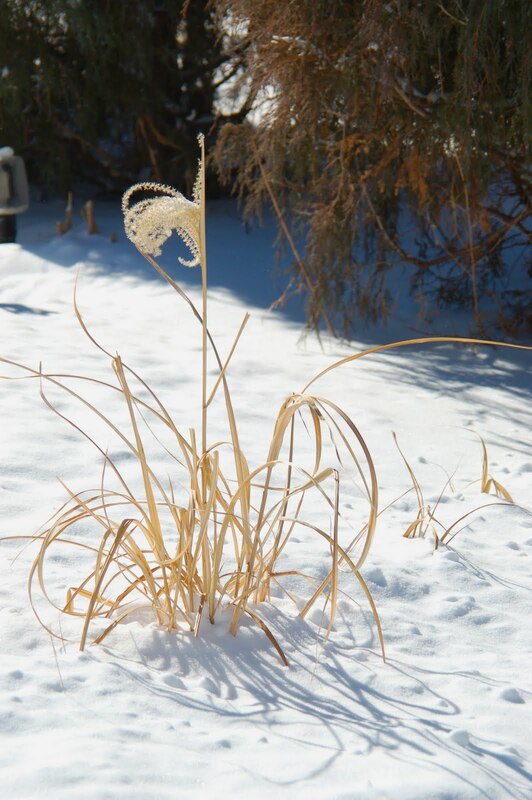 Winter has settled over the plains of Colorado. It came late to us...with warm temperatures into December, but January and February are proving to be cold and gray. Last night, we had another blast of snow and temperatures were low today. It's a true winter, and after so many years of 'warmish' winters, it's really a change. I do not have a car with great snow shoes (so to speak). I slip and slide all over the place and getting up hills is usually done with a prayer and a lot of luck. It's hard to get things done quickly, which is frustrating. Oh well, it sure looks pretty! Today, the sun came out in the late afternoon. It's a pretty view from the studio. I haven't really been able to spend a lot of time in the studio.... it gets so cold this time of year, even with the space heater. However, on Fridays, we have our art group and that is usually in someone's warm kitchen. Last week, I brought my watercolors and looked for something to do. 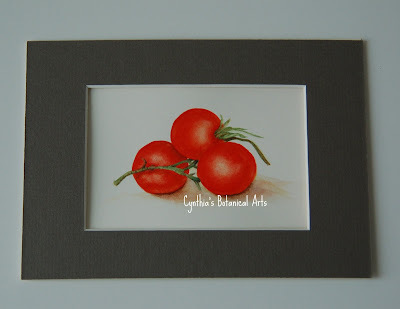 I spied a bowl of tomatoes, and decided to paint them on a small 4x6 fabriano watercolor pad. I found a small frame which was laying around the studio and popped that on it...before taking this photo. I think that I gravitated to the tomatoes because of the red and warmth of the color. I did a few quick and freehand watercolors. I will share another tomorrow. A splash of red for February! Sweet Hubby is now officially retired. It's definitely going to be a new experience for both of us. We have lots to do, individually, so we are not hanging out together, too much. So far, it's been really nice, and he has a perpetual grin on his face. He is happy to leave the work force behind. We plan to head to the Botanical Gardens in Denver, this week, which will be beautiful. I will take some photos for you when we go. Sorry friends, but it's too cold for me to go outside..... bitter temperatures do not agree with my body, as I had frostbite as a kid in Minnesota, and my fingers and toes do NOT like the cold. I have big mittens, woolen scarves, a fuzzy hat and Uggs on my feet, but I can't work the camera without exposing my fingers to the cold. My studio is freezing..... seriously! It cannot even break into the fifties when it is so cold out, so I run in there and take a peek and run out again. It should be better by Thursday, so plan to work as soon as possible. Since the weather is not cooperating, I am spending today matting and backing a painting that will be in a Denver Show, starting in March. It's a good thing to do on a very cold day. 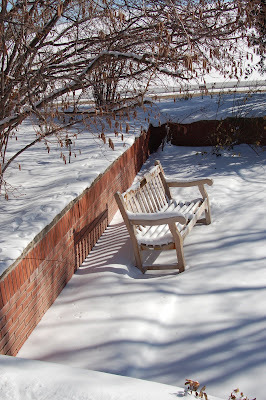 I can't complain....Colorado has been very lucky this winter, and these cold snaps have been short (if not fierce). We have also had lots of sunshine and warm temperatures. I will leave you with a Baiku (sort of a different version on the Haiku). My oldest son and I are exchanging Haiku and Baiku on Monday mornings. It's a fun way to communicate in these busy times. We plan to keep all of our work this year and publish our own little book. What fun! (that was his idea...which I thought was a great one). As for my husband.... He just THOUGHT he was done last week. Ha...a good friend called in a panic, after he broke a tooth. So emergency repairs are in order this week. I truly think that by this Friday, it will be totally official. He will walk away feeling that he has done a great job to the end. I am so proud of him.... he is deserving of some fun time.